We all want a world in which everyone can live free of fear, regardless of the color of their skin, their ethnic background, or their religion. But today, white nationalist and neo-Nazi movements are on the rise, fueled in no small part by the words and actions of right-wing politicians in the United States, like Rep. Steve King from Iowa and Rep. Matt Gaetz from Florida. Our new report, Bankrolling Hate: How Wall Street Supports Racist Politicians and Enables White Supremacy, shows how big banks like Wells Fargo, JPMorgan Chase, and Bank of America have contributed to the rise of these violent, extremist movements. We need to tell these banks to stop bankrolling hate! Sign the petition and then read the report. The Christchurch mosque shootings last week, in which a white supremacist killed 50 Muslims, show us that when American politicians stoke the flames of white hatred and bigotry, it has global impacts. 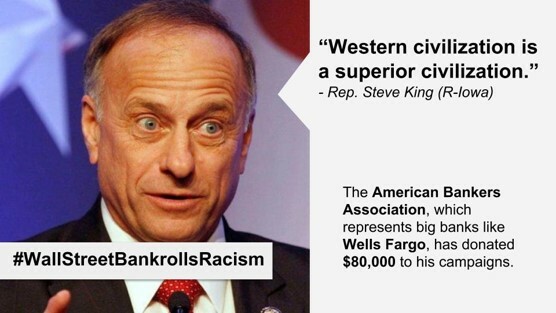 Trade associations that represent big banks like Wells Fargo, JPMorgan Chase, and Bank of America are major contributors to the campaigns of racist candidates like King, Gaetz, Rep. Greg Gianforte from Montana, and former Rep. Lou Barletta from Pennsylvania. Wells Fargo, JPMorgan Chase, and Bank of America are members of both the American Bankers Association and the American Financial Services Association. The ABA and AFSA have contributed more than $150,000 to the campaigns of these white supremacist politicians. In fact, the ABA is the second largest donor to King's campaigns over the course of his entire career. These banks have blood on their hands. Their support of these politicians through the ABA and AFSA means they are complicit in the rise of right-wing violence around the world. As some of the largest financial institutions in the world, these banks hold tremendous power in both the ABA and AFSA. Sign our petition to demand they use that power to ensure that both of these groups stop contributing to candidates like King, Gaetz, Gianforte, and Barletta that espouse bigotry or incite violence against people because of their race, ethnicity, or religion. Their profits are not more important than the safety of communities of color around the globe. We all want a world in which everyone can live free of fear, regardless of the color of their skin, their ethnic background, or their religion. But today, white nationalist and neo-Nazi movements are on the rise, fueled in no small part by the words and actions of right-wing politicians in the United States, like Rep. Steve King from Iowa and Rep. Matt Gaetz from Florida. The Christchurch mosque shootings last week, in which a white supremacist killed 50 Muslims, show us that when American politicians stoke the flames of white hatred and bigotry, it has global impacts. Your bank is a member of both the American Bankers Association and the American Financial Services Association. The ABA and AFSA have contributed more than $150,000 to the campaigns of these white supremacist politicians. In fact, the ABA is the second largest donor to King's campaigns over the course of his entire career. You have blood on your hands. Your support of these politicians through the ABA and AFSA means you are complicit in the rise of right-wing violence around the world. As CEO of one of the largest financial institutions in the world, you hold tremendous power in both the ABA and AFSA. We demand that you use that power to ensure that both of these groups stop contributing to candidates like King, Gaetz, Gianforte, and Barletta that espouse bigotry or incite violence against people because of their race, ethnicity, or religion. If they continue supporting these candidates, then we demand that you withdraw from these groups. Your profits are not more important than the safety of communities of color around the globe.